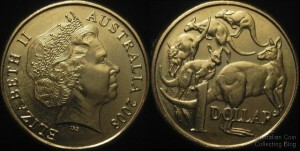 The rabbit ear on the mob of roos Australian 1 dollar coin is caused by a die break or chip resulting in a raised cud representing an extra ear on the top kangaroo. 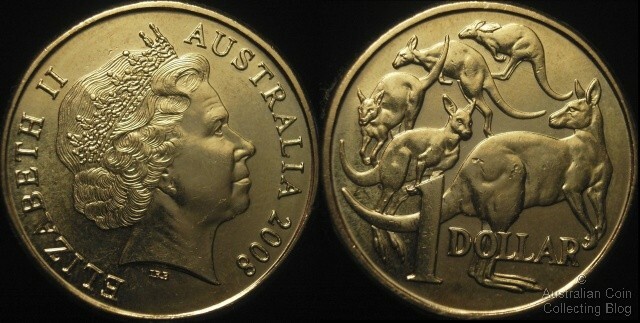 It can be found on the 1984, 1985, 1994, 1998, 2000, 2006, 2008, 2009, 2010, 2013, 2015 and 2016 dated dollar coins. 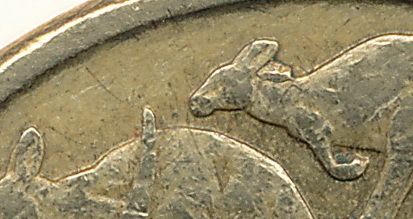 Above you can see the rabbit ear variety on a 1985 coin found in circulation, the rarest of all the rabbits. The cuds can be found in varying sizes on most years. No rabbit ears have been found in mint sets. Below is a 2008 rabbit in higher grade.